You may not know who Red Bairn Photography is but you really ought to know. He’s a very talented photographer and videographer based in Aberdeen, Scotland specializing in event, performance and portraiture, as well as dipping into the cosplay side of photography. He strives in capturing true life moments and representing them as clear and striking images! Here are some of his favourite cosplay photos that he personally enjoys. We have linked to Facebook pages or Twitter accounts where possible so if you want to see more from these cosplayers, just try clicking their name! RBP: The photos aren’t in any real “favourite” order and I’m not sure if these are my best photos, but certainly a selection of the ones that stand out with a bit of meaning to me. In 2013, Star Wars Celebration came back to Europe in the form of “Celebration Europe II” Hosted in Messe Essen, Germany. I spent a very long weekend with the Imperial Scottish Squad, UK Garrison & 501st Legion costuming groups taking as many photographs as I could. I was fortunate enough to be asked to follow this group of troopers who were the worldwide first Ralph McQuarrie concept art troopers. I was even luckier to be asked to go back stage with them after Dave Filoni had just presented the first look at Star Wars: Rebels in front of a packed auditorium. This was definitely one of those “Please don’t make a mess of this” moments. I absolutely adore costumers who completely embody the character they’re portraying. In this instance I completely believed in Judge Nodes (Steve Noden) and his willingness to put me away in the Iso Cubes if I didn’t catch his best side. Unfortunately, I never caught the name of these two really impressive X-Men costumers outside LFCC last summer. They instantly stopped as soon as I approached them to ask for a photograph and dropped flawlessly into character. Peter is literally screwed into potentially the most restrictive, claustrophobic and visually impressive costumes I’ve ever seen. His mannerisms whilst out in costume are absolutely perfect! 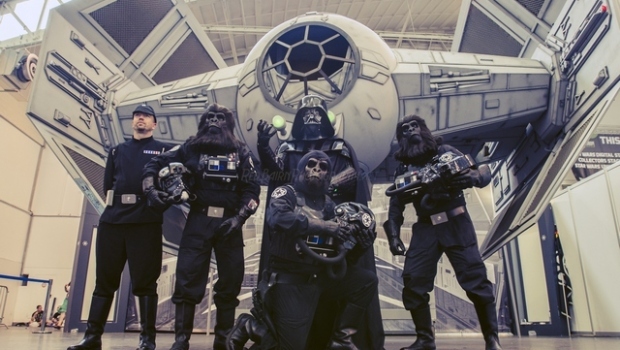 Whilst on some down time from official business with the UK Garrison, three of the guys who are also Planet of the Ape costumers took to the convention hall to cause some havoc in these cross over costumes. Colin plays a perfect Indy, complete with a wide array of props. So when I asked to set up this shot he even came with his own small bag of sand. The Marines are always on hand to look incredibly cool in costume, striking a pose with the mere hint of a camera being pointed in their direction. Rocco and Leo Weir happen to have some of the coolest parents around. Fact. Unfortunately I didn’t catch the costumers name here, but he captured the essence of John Hurt’s character tremendously. Matthew with the help of a fantastic sculptor put together this brilliant costume that would make a lot of people bow. I’ll admit to being on one knee whilst taking this. It’s amazing how much character and emotion can be portrayed by the eyes alone, but these two from the Reel Icons are wonderful. With a bit of mood lighting an already sinister looking costume can look incredibly creepy. James has a great Alien costume. Marc seen here at the National Space Center in Leicester. As is always the way, this was a quick off the cuff shot before we’d set up the larger group shot in the background. Kirsty and Dominic put together a brilliant couple of Barbarians from my favourite game series. Outstanding work. Heavy Metal Princess, Cosplayer, photographer.